How do you know if you are the guy on the lawn or the guy telling people to get off his lawn? 3,300 miles, 60-ish hours of driving plus 18 hours of working on our truck later we’d driven from Arizona to Canada and back to Arizona ...and we’d cut the roof off our Land Cruiser. Nothing too fancy, just a day trip to central CO just a smidge into the Rockies. The weather was absolutely perfect. I tried to enjoy it and not think about reasons why it’s been 60 degrees in the Rockies in January and why there was almost no snow. Great vids, love the truck.. aww, makes me want to look at a weekend truck. UPDATE - Toyota to the rescue! My pleasure, looking forward to having you here! Deal, just bear in mind its not a content dump zone. Come for the chips stay for the conversations. This is great, mind if I share this to https://overland.kinja.com/? Now you’re making me want a Land Cruiser built out for this. DANGIT. This guy...this is the guy. This is the short version of this interview with Dan who is both family and friend as well as o&e member. Enjoy his enginerd walkthrough courtesey of overland bound. Long version here. 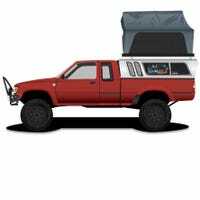 Check it out brothers and sisters: OverlandNomad’s cool Toyota pickup is the featured vehicle over on Expedition Portal! Neat. I like that ‘hi-lux’ and I’ve always thought the Wildernest was very cool. Think in ever-widening circles... Southern Utah is perfect for that rig... or vice versa. I did. If it weren’t for the paychecks I’m getting, I’d be back in a heartbeat. Dang, I miss living in Texas. Y u no post on http://overland.kinja.com ?